March 14, 2014 /0 Comments/in Diabetes /by Jenn F.
“The world is an oyster,” according to Shakespeare’s The Merry Wives of Windsor. If you have the financial means and the time to travel, there are unlimited possibilities for the adventures you may have. Unfortunately, there are additional considerations if you have diabetes. You may worry whether or not you will be able to do all the walking that often comes along with traveling away from home. You may also fret over how nerve damage or calluses can impact your trip. Traveling with diabetes feet can be a challenge, but it’s a manageable one with these tips from the makers of SteriShoe. High blood sugar levels for a prolonged period of time can lead to damaged blood vessels and decreased circulation in the feet. This, in turn, can weaken the skin’s protective barrier, inhibit wound healing, and contribute to ulcer formation. Certain types of bacteria and fungi feed on high levels of sugar in the bloodstream, causing another level of complications. Deep skin and bone infections could lead to amputations if you’re not vigilant about managing your glucose levels. Nerve damage (also known as neuropathy) also occurs as a result of elevated blood sugar levels over time. Not only does this contribute to a loss of sensation in the foot, but it can also weaken foot muscles, causing deformity. When you are traveling, eat foods (like apples and nuts) that help regulate blood sugar levels, and be sure to eat regular meals and snacks to prevent blood sugar spikes or crashes. Understand factors that cause blood sugar levels to fluctuate — such as eating, exercise, stress, medications, and illness. Keep an eye out for symptoms of high blood sugar like fatigue, frequent urination, constant thirst, and blurry vision. Check your blood sugar levels several times a day and set cell phone reminders if you have to. There are even helpful apps available to help monitor health conditions. It might be worth downloading one before your trip to help track your blood sugar levels while out and about seeing the sights. 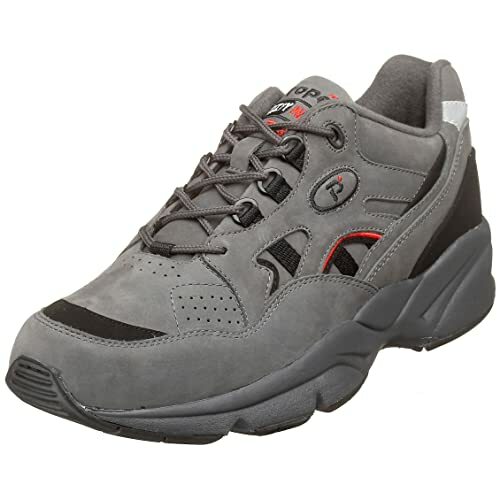 The Propet Men’s Stability Walker is great for diabetes feet, but doesn’t look like an “orthopedic” shoe. When you travel, there are literally many more steps to take, which can cause pain and fatigue for diabetics. The importance of having the right footwear cannot be overstated. A smart plan of attack includes orthopedic shoes suited for diabetics, as well as a pair of custom orthotics specially designed to reduce the amount of pressure on your diabetes feet. Don’t forget to also pack the right type of socks to protect your feet. Preventing small cuts, blisters, calluses, and corns will keep you safe from ulceration and its related complications. Try not to assume you’ll be stuck with hideous orthopedic shoes. Modern shoes for diabetics needn’t be considered a fashion faux pas. Be sure to check out our October post on the 10 best shoes for diabetics. Athletic shoes like the Propet Stability Walker or Dr. Comfort Women’s Sandy Lace-up Shoe are stylish and well-suited for all the extra walking you’ll be doing on your trip. Diabetes Health magazine offers additional brand suggestions for diabetics in the market for new travel-worthy footwear. Keep in mind, Medicare and some other insurers cover the cost of diabetic footwear. If you are leaving for your trip very soon, you can buy orthotic shoe inserts from Dr. Scholls over-the-counter at any pharmacy. If you have a month or more before you travel, meet with a podiatrist to get a pair of decent orthotics that will unload pressure and prevent foot pain. The SteriShoe UV shoe sanitizer is easy to pack and bring with you on vacation. Lastly, we recommend packing the SteriShoe UV shoe sanitizer with your luggage on your next trip. This small, portable gadget will keep your shoes sanitized and free of bacteria, fungi, viruses, and other harmful pathogens. With all the new ground you’ll be covering and all the walking you’ll be doing, germ protection will be a bigger concern than usual. It’s the exposure to harmful microbes that puts so many diabetes feet in peril, turning a run-of-the-mill cut into a life-threatening situation. A quick, 45-minute treatment will zap your footwear of up to 99.9% of the harmful microbes lurking within. Buy a shoe sanitizer here!